DEFENDING champion Ateneo de Manila vented its ire on De La Salle Zobel, 69-54, and returned to its winning ways in the UAAP Season 81 juniors basketball tournament on Sunday at the Blue Eagle Gym. Still smarting from an 80-87 overtime loss to Far Eastern University last week, the Blue Eaglets banked on Angelo David and Kai Sotto to put their acts together and tie the Baby Tamaraws for second place on 3-1 win-loss records. David went 5-of-8 from three-point land to finish with 20 points while 7-foot-3 Sotto dominated with 11 points 13 rebounds, five assists, and three blocks. The Blue Eaglets will battle UPIS Junior Maroons next Saturday, just three days after the senior counterparts of both sides clash in Game Two of the UAAP Finals. Jac Macasaet single-handedly carried the loads of De La Salle with 18 points as they dropped to 2-2 slate and will face FEU (3-1) on Saturday next week at 9 a.m.
University of Santo Tomas, meanwhile, also bounced back from a loss last week with a 70-60 win over University of the East. Rookie Mark Nonoy powered the Tiger Cubs with 25 points, Johnvic Casingcasing chipped in 12 points and seven rebounds as UST improved to 2-2. John Lina contributed eight points and 10 boards while Carlos Sumabat added eight for the Cubs. The Tiger Cubs fought back from a 48-52 deficit at the start of the fourth period by going on a 22-5 run capped by Nonoy’s lay-up for a 70-57 lead. Shane Dichoso was the only bright spot for the Junior Warriors with 26 points off six three-pointers to go with five assists and four rebounds as UE dropped to 0-4 before it takes on unbeaten leader NU (4-0) on Saturday at 1 p.m.
UST (70) - Nonoy 25, Casingcasing 12, Lina 8, Sumabat 8, Manabat 5, Estrella 4, Amador 4, Benzonan 2, Marzan 2, Barranco 0, Oliva 0. UE (60) - Dichoso 26, Sullano 9, Villarta 9, Flores 6, Manaug 4, Almacen 4, Escamilla 2, Tajonera 0, Dy Tioco 0, Agbas 0, Alinsoring 0, Lima 0, Santos 0, Tan 0, Gatdula 0, Mendoza 0. Quarters: 16-17, 31-28, 48-52, 70-60. 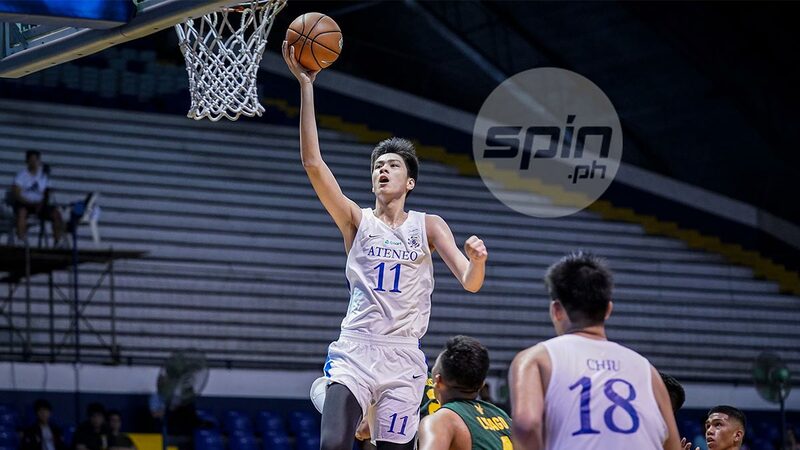 Ateneo (69) – David 20, Sotto 11, Diaz 8, Espinosa 7, Chiu 6, Jaymalin 6, De Ayre 4, Coo 3, Fetalvero 2, Salandanan 2, Lechoncito 0, Pangilinan 0, Ladimo 0, Narciso 0, Corral 0. La Salle (54) – Macasaet 18, Jomalesa 14, Cudiamat 9, Subido 5, Buncayo 4, Luna 2, Unisa 2, Milan 0 Pingol 0, Marana 0, Villarin 0, Sevilla 0, Danao 0, Dee 0. Quarters: 18-7, 30-18, 44-36, 69-54.